fine, have a look at my belly. Compare to this picture, when I was 37 weeks along with Carson. (Yes, I wore the same outfit on purpose.) Basically, I'm huge. We didn't give Carson much hoopla for his first birthday. To show him it was his special day, we allowed him to eat cheese for breakfast. The evening of his birthday, he opened some presents. The day after his birthday, I finally got around to making his chocolate zucchini cupcakes (with applesauce instead of oil and whole wheat flour!). He enjoyed consuming an entire cupcake (with lots of chocolate frosting), and then threw up about an hour later. It was a great birthday! Carson held his cupcake to his mouth like this for about two minutes straight. Maybe he was afraid I'd take it away from him, as I usually do with anything sugar-filled! Web-camming with silly pappy, who happens to have a turkey on his head. climbing up onto the couch, onto his train table, and on the shelf underneath his changing table. Carson was sick a few days before his birthday. Sad, but sooo cute an cuddly. 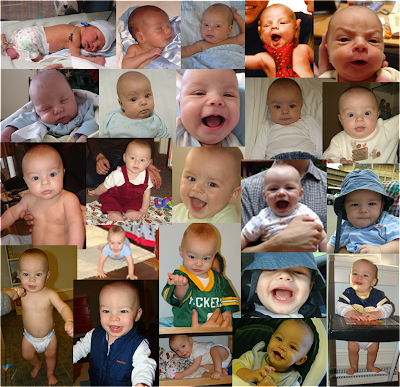 From 5 pounds to 20, here's how our little boy grew this past year. How I Found Out I Was Pregnant: A Story. After a summer of traveling halfway across the world (to Cambodia) and back ALONE with a baby, then crossing the U.S. a couple of times to see some family and then move back out east, it was no wonder that I felt tired during the first couple of weeks we lived here. As the weeks turned into months, and the fatigue persisted, the thought crossed my mind, "I haven't felt this tired since... I was pregnant with Carson!" That thought was quickly pushed out of my mind, as there was no way I could be pregnant again. And then, it became difficult to button my pants. Unfortunately, "Rick, I'm getting fat" is a pretty common declaration in our house, so he and I paid little attention to my seemingly expanding waistline. I kept exercising and, again, pushed any nagging thoughts of a possible pregnancy out of my mind. And then finally, the day arrived in early September when something inside of me clicked, and suddently I knew why I couldn't keep my eyes open after 8:00 p.m., and why I couldn't button my pants without lying on the floor and sucking in with all my might, and why I was having a hard time producing enough milk for poor little Carson. That day, I pushed Carson up some nice hills for the 1.5 mile jog to the library. He and I went pretty much everywhere with the jogging stroller in those days. I was excited to check out a book that I'd had on hold, and I had some items to return. "That will be a 10 dollar late fee," the librarian demanded. I froze. 10 dollars??? After a little discussion about why on earth I owed 10 dollars for a DVD I didn't even watch and had no idea that was late, I was forced to pay the fee. As I dug in my wallet for some bills and loose change, my eyes started to fill with tears. I quickly shoved the money towards the librarian, checked out my book, and ran out of the library, trying to stifle the sobs before they all broke loose. I bent down to make sure Carson was buckled in (and to hide my wet face from public view), and suddenly, it hit me. I was crying. Hard. Over a late fee from the library. I had to be pregnant. The end. Except it's really the beginning I guess, because a week later I had an ultrasound which revealed that I had actually been pregnant for nearly 3 months, without anyone bothering to let me know there was a baby growing inside of me. Now I'm 5 months pregnant, one appendix less, looking like I'm about 8 months pregnant, and we're excited to have 2 little boys who we hope and pray will be best friends. The real end. I snuck this shot of Carson having some daddy time. And Carson's newest trick is flushing the toilet. Great. And that was my 100th post!! Thank you, thank you. 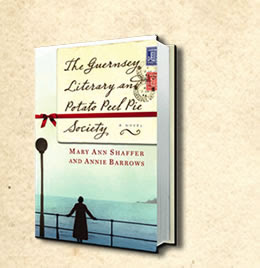 The Guernsey Literary and Potato Peel Pie Society by Mary Ann Shafer and Annie Barrows. I love, love, LOVE this book. It's written entirely in letters, and it takes place just after World War II has ended. It's hard to articulate a brief summary of the plot, but I'll try... Juliet, a single writer living in London, receives a letter from a stranger, a man who lives in the British island of Guernsey. He inquires about a book with her name written in it, and they develop a friendship through writing letters. Juliet learns that her new friend belongs to a Literary Society created as a cover-up during the German Occupation in Guernsey. Eventually, all the members of the Society write to Juliet, describing their experiences during the war. These charming people, the residents of Guernsey, fall in love with Juliet and she with them. I, too, still smile and laugh a little when I think of their delightful letters!! Juliet ends up meeting her friends in person, and then the traditional love story takes place, which made me very happy! I also appreciated a new view of some of the heart-wrenching suffering that took place during World War II. Residents of Guernsey were forced to send their children away, and then to live without food, soap, etc., and in constant fear of their German oppressors. This book is just the perfect blend of a little bit of romance, some well-researched history, lots of references to literature and the arts, and a group of characters that seem like some of the most delightful people who've ever lived! I would absolutely recommend getting to know Juliet, Dawsey, Amelia, Isola, and the rest of the crew!! Are the (huge) size, (awkward) spacing, and (unattractive) crookedness of my baby's teeth any indicator of his future dental anatomy??? I still get startled when Carson flashes a big smile. The sweet, toothless baby is no more. I miss the gummy smile, and the kisses that did not include painful bites. It is 10:30 a.m., and I just changed big, full, stinky, poopy diaper number 3 of the day. Is this normal?? I've heard rumors of children that have poopy diapers only once a day, or even less frequently. Do they really exist?? What should I make for dinner?? The burning questions of this stay-at-home mom. In case anyone is curious about a health update, I feel great!! I am ecstatic about my new abilities to sleep and stay asleep without waking up in pain, walk faster slightly faster than Carson can crawl, and hold Carson without defensively guarding my abdomen against any slight wiggle. I can't say I'm glad I was sick, but being out of commission for a week or two sure does wonders to make a stay-at-home mom appreciate her lot in life! Yesterday, I could not wait to get out the cleaning supplies and attack the bathroom. I vacuumed, swept, mopped, etc. and was so happy to be doing so! I organized Carson's clothes in his new (to us) dressers and can't stop walking by his room to admire my work. (ok, actually my father-in-law's work. He painted the dressers, and Carson's room is looking so cute! Pictures to come.) I appreciated and enjoyed playing with Carson much more than before. Perhaps we get sick in order to appreciate being well!! Oh, and I actually got the courage up to cut Rick's hair, and this time it looks decent! I scrounged up this picture from my last attempt to cut his hair, nearly a year ago. Oops. The clippers just got away from me! This time, working with scissors, his poor head fared much better. Phew.